Beersheba, also Be'er Sheva (/bɪərˈʃiːbə/; Hebrew: בְּאֵר שֶׁבַע Be'er Sheva [be.eʁˈʃeva]), is the largest city in the Negev desert of southern Israel. Often referred to as the "Capital of the Negev", it is the center of the fourth most populous metropolitan area in Israel, the eighth most populous Israeli city with a population of 207,551, and the second largest city with a total area of 117,500 dunams (after Jerusalem). The Biblical period references to Beersheva refer to a site, Tel Be'er Sheva, lying some 2 and a half miles distant from the modern city, which was established the start of the 20th century when a permanent settlement was established by the Ottoman Turks. The city was captured by the British led Australian Light Horse during World War I. In 1947, Bir Seb'a (Arabic: بئر السبع‎), as it was known, was envisioned as part of the Arab state in the United Nations Partition Plan for Palestine. Following the declaration of Israel's independence, the Egyptian army amassed its forces in Beersheba as a strategic and logistical base. In the Battle of Beersheba waged in October 1948, it was conquered by the Israel Defense Forces. Beersheba has grown considerably since Israel's independence. A large portion of the population is made up of the descendants of Sephardi Jews and Mizrahi Jews who immigrated from Arab countries after 1948, as well as smaller communities of Bene Israel and Cochin Jews from India. Second and third waves of immigration have taken place since 1990, bringing Russian-speaking Ashkenazi Jewish immigrants from the former Soviet Union, as well as Beta Israel immigrants from Ethiopia. The Soviet immigrants have made the game of chess a major sport in Beersheba and the city is now a developing technology center. The city is now Israel's national chess center, with more chess grandmasters per capita than any other city in the world. Be'er is the Hebrew word for well; sheva could mean "seven" or "oath" (from the Hebrew word shvu'a). In this case the meaning is probably "oath", as the ancient Hebrews believed seven to be a lucky number, and the Hebrew "shvu'a" (to take an oath) literally means "to seven oneself". During Ottoman administration the city was referred as بلدية بءرالسبع (Belediye Birüsseb'). Beersheba is mainly dealt with in the Hebrew Bible in connection with the Patriarchs Abraham and Isaac, who both dig a well and close peace treaties with King Abimelech of Gerar at the site. Hence it receives its name twice, first after Abraham's dealings with Abimelech (Genesis 21:22-34), and again from Isaac who closes his own covenant with Abimelech of Gerar and whose servants also dig a well there (Genesis 26:23-33). The place is thus connected to two of the three Wife–sister narratives in the Book of Genesis. According to the Hebrew Bible, Beersheba was founded when Abraham and Abimelech settled their differences over a well of water and made a covenant (see Genesis 21:22-34). Abimelech's men had taken the well from Abraham after he had previously dug it so Abraham brought sheep and cattle to Abimelech to get the well back. He set aside seven lambs to swear that it was he that had dug the well and no one else. Abimelech conceded that the well belonged to Abraham and, in the Bible, Beersheba means "Well of Seven" or "Well of the Oath". Beersheba is further mentioned in following Bible passages: Isaac built an altar in Beersheba (Genesis 26:23–33). Jacob had his dream about a stairway to heaven after leaving Beersheba. (Genesis 28:10–15 and 46:1–7). Beersheba was the territory of the tribe of Simeon and Judah (Joshua 15:28 and 19:2). The sons of the prophet Samuel were judges in Beersheba (I Samuel 8:2). Saul, Israel's first king, built a fort there for his campaign against the Amalekites (I Samuel 14:48 and 15:2–9). The prophet Elijah took refuge in Beersheba when Jezebel ordered him killed (I Kings 19:3). The prophet Amos mentions the city in regard to idolatry (Amos 5:5 and 8:14). Following the Babylonian conquest and subsequent enslavement of many Israelites, the town was abandoned. After the Israelite slaves returned from Babylon, they resettled the town. According to the Hebrew Bible, Beersheba was the southernmost city of the territories settled by Israelites, hence the expression "from Dan to Beersheba" to describe the whole kingdom. Zibiah, the consort of King Ahaziah of Judah and the mother of King Jehoash of Judah, was from Beersheba. Human settlement in the area dates from the Copper Age. The inhabitants lived in caves, crafting metal tools and raising cattle. Findings unearthed at Tel Be'er Sheva, an archaeological site east of modern-day Beersheba, suggest the region has been inhabited since the 4th millennium BC. The city has been destroyed and rebuilt many times over the centuries. During the Persian rule 539 BC–c. 332 BC Beersheba was at the south of Yehud Medinata autonomous province of the Persian Achaemenid Empire. During that era the city was rebuilt and a citadel had been built. Archeological finds from between 359 and 338 BC have been made and include pottery and Ostracon. During the Hasmonean rule, the city did not take importance as it was not mentioned when conquered from Edom or described in the Hasmonean wars. During Roman rule the city was in the Coele-Syria region. During the Roman era and later Byzantine periods, the town served as a front-line defense against Nabatean attacks. Around 64-63 BC Gnaeus Pompeius Magnus made Be'er Sheva the southern part of the Judea province, in the following years the city was on the limes belt (the limes belt in the region attributed to Vespasian era), The city become center of the Eparchy in around 268. During the 4th century, Beersheba was described in the Madaba Map and Eusebius of Caesarea as a large village with a Roman garrison. The last inhabitants of Tel Be'er Sheva were the Byzantines, who abandoned the city during the Muslim conquest of the Levant. The city was destroyed and remained abandoned until the late 19th century. Some pottery from late Byzantine and early Islamic rule has been found. In June 1899, the Ottoman government ordered the creation of the Beersheba sub-district (kaza) of the district (mutasarrıflık) of Jerusalem, with Beersheba to be developed as its capital. Implementation was entrusted to a special bureau of the Ministry of the Interior. There were multiple reasons for the decision. The British incorporation of Sinai into Egypt led to a need for the Ottomans to consolidate their hold on southern Palestine. There was also a desire to encourage sedentation of the Bedouin, with a predicted increase of tranquility and tax revenue. The first governor (kaymakam), Isma'il Kamal Bey, lived in a tent lent by the local sheikh until the government house (Saraya) was built. Kamal was replaced by Muhammed Carullah Efendi in 1901, who in turn was replaced by Hamdi Bey in 1903. The governor in 1908 was promoted to 'adjoint' (mutassarrıf muavin) to the governor of the Jerusalem district, which placed him above the other sub-district governors. Beersheba grows from day to day; This year, instead of the tents, we found stately houses along a beautiful road from the Sarayah to the bed of the wadi. In the government building a garden has been laid out, and all sorts of trees have been planted which are sure to prosper, for the few shrubs planted two years ago by the steam mill at the south-east end of the road have grown considerably. The lively construction activity is also causing a lively exploitation of the ruins. By 1907 there was a large village and military post, with a residence for the kaymakam and a large mosque. The population increased from 300 to 800 between 1902 and 1911 and by 1914 there were 1,000 people living in 200 houses. A plan for the town in the form of a grid was developed by a Swiss and a German architect and two others. The grid pattern can be seen today in Beersheba's Old City. Most of the residents at the time were Arabs from Hebron and the Gaza area, although Jews also began settling in the city. Many Bedouin abandoned their nomadic lives and built homes in Beersheba. During World War I, the Ottomans built a military railroad from the Hejaz line to Beersheba, inaugurating the station on October 30, 1915. The celebration was attended by the Ottoman army commander Jamal Pasha and other senior government officials. The train line was active until the British Army forced the Ottomans out in 1917, towards the end of the war. Beersheba played an important role in the Sinai and Palestine Campaign in World War I. The Battle of Beersheba was part of a wider British offensive in World War I aimed at breaking the Turkish defensive line from Gaza to Beersheba. On October 31, 1917, three months after taking Rafah, General Allenby's troops breached the line of Turkish defense between Gaza and Beersheba. Approximately five-hundred soldiers of the Australian 4th Light Horse Regiment and the 12th Light Horse Regiment of the 4th Light Horse Brigade, led by Brigadier General William Grant, with only horses and bayonets, charged the Turkish trenches, overran them and captured the wells in what has become known as the Battle of Beersheba, called the "last successful cavalry charge in British military history." On the edge of Beersheba's Old City is a Commonwealth War Graves Commission Cemetery containing the graves of Australian, New Zealand and British soldiers. The town also contains a memorial park dedicated to them. During the Palestine Mandate, Beersheba was a major administrative center. The British constructed a railway between Rafah and Beersheba in October 1917; it opened to the public in May 1918, serving the Negev and settlements south of Mount Hebron. In 1928, at the beginning of the tension between the Jews and the Arabs over control of Palestine, and wide-scale rioting which left 133 Jews dead and 339 wounded, many Jews abandoned Beersheba, although some returned occasionally. After an Arab attack on a Jewish bus in 1936, which escalated into the 1936–39 Arab revolt in Palestine, the remaining Jews left. At the time of the 1922 census of Palestine, Beersheba had a population of 2,012 Muslims, 235 Christians, 98 Jews and 11 Druze (total 2,356). At the time of the 1931 census, Beersheba had 545 occupied houses and a population of 2,791 Muslims, 152 Christians, 11 Jews and 5 Bahá'í (total 2,959). The 1945 village survey conducted by the Palestine Mandate government found 5,360 Muslims, 200 Christians and 10 others (total 5,570). In 1947, the United Nations Special Committee on Palestine (UNSCOP) proposed that Beersheba be included within the Jewish state in their partition plan for Palestine. However, when the UN's Ad Hoc Committee revised the plan, they moved Beersheva to the Arab state on account of it being primarily Arab. 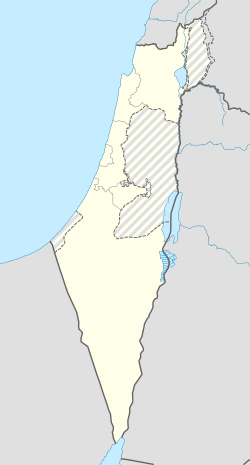 Egyptian forces had been stationed at Beersheva since May 1948. During the 1948 Arab–Israeli War, Israel launched Operation Yoav, in breach of a truce that had been arranged, by creating a ruse - two fuel trucks were marked for explosion if the Egyptians opened fire when the convoy penetrated the Negev -and when the Egyptians did fire, the explosion formed the pretext for Israel to justify the operation. It was Yigal Allon who proposed the conquest of Beersheba,which was approved by Prime Minister David Ben-Gurion. According to Israeli historian Benny Morris, he ordered the "conquest of Beersheba, occupation of outposts around it, [and] demolition of most of the town." The objective was to break the Egyptian blockade of Israeli convoys to the Negev. The Egyptian army did not expect an offensive and fled en masse. Israel bombed the town on October 16, At 4:00 am on October 21, the 8th Brigade's 89th battalion and the Negev Brigade's 7th and 9th battalions moved in, some troops advancing from Mishmar HaNegev junction, 20 kilometres (12 mi) north of Beersheba, others from the Turkish train station and Hatzerim. By 9:45, Beersheba was in Israeli hands. Around 120 Egyptian soldiers were taken prisoner. All of the Arab inhabitants, who had resisted, were expelled  with the remaining Arab civilians, 200 men and 150 women and children, taken to the police fort and, on October 25, the women, children, disabled and elderly were driven by truck to the Gaza border. The Egyptian soldiers were interned in POW camps. Some men lived in the local mosque and were put to work cleaning but when it was discovered that they were supplying information to the Egyptian army they were also deported.The town was subject to large-scale looting by the Haganah, and by December, in one calculation, the total number of Palestinians driven out from Beersheva and surrounding areas reached 30,000 with many ending up in Jordan as refugees. Following Operation Yoav, a 10-kilometer radius exclusion zone around Beersheba was enforced into which no Bedouin were allowed.In response, the United Nations Security Council passed two resolutions on the 4th and 16th of November demanding that Israel withdraw from the area. Following the conclusion of the war, the 1949 Armistice Agreements formally granted Beersheba to Israel.The town was then transformed into an Israeli city with only an exiguous Arab minority. Beersheba was deemed strategically important due to its location with a reliable water supply and at a major crossroads, northwest to Hebron and Jerusalem, east to the Dead Sea and al Karak, south to Aqaba, west to Gaza and southwest to Al-Auja and the border with Egypt. After a few months, the town's war-damaged houses were repaired. As a post-independence wave of Jewish immigration to Israel began, Beersheba experienced a population boom as thousands of immigrants moved in. The city rapidly expanded beyond its core, which became known as the "Old City," as new neighborhoods were built around it, complete with various housing projects such as apartment buildings and houses with auxiliary farms, as well as shopping centers and schools. The Old City was turned into a city center, with shops, restaurants, and government and utility offices. An industrial area and one of the largest cinemas in Israel were also built in the city. By 1956, Beersheba was a booming city of 22,000. In 1959, during Wadi Salib riots, riots spread quickly to other parts of the country, including Beersheba. Soroka Hospital opened its doors in 1960. By 1968, the population had grown to 80,000. The University of the Negev, which would later become Ben-Gurion University of the Negev, was established in 1969. The then Egyptian president Anwar Sadat visited Beersheba in 1979. In 1983, its population was more than 110,000. As part of its Blueprint Negev project, the Jewish National Fund is funding major redevelopment projects in Beersheba. One project is the Beersheba River Walk, a 900-acre (3.6-square-kilometre) riverfront district with green spaces, hiking trails, a 3,000-seat sports hall, a 15-acre (6.1-hectare) boating lake filled with recycled waste water, promenades, restaurants, cafés, galleries, boat rentals, a 12,000-seat amphitheater, playgrounds, and a bridge along the route of the city's Mekorot water pipes. The plans include building new homes overlooking the park and neighborhood. At the official entrance to the river park will be the Beit Eshel Park, which will consist of a park built around a courtyard with historic remains from the settlement of Beit Eshel. Four new shopping malls are planned. The first, Kanyon Beersheba, will be a 115,000-square-metre (1,240,000-square-foot) ecologically planned mall with pools for collecting rainwater and lighting generated by solar panels on the roof. It will be situated next to an 8,000-meter park with bicycle paths. Another mall will be a farmer's market, the first ever in Israel. It will be an enclosed, circular complex with 400 spaces for vendors, and it will be surrounded by parks and greenery. A new central bus station has been built in the city. The station has a glass-enclosed complex also containing shops and cafés. In recent years, some $10.5 million has been invested in renovating Beersheba's Old City, preserving historical buildings and upgrading infrastructure. The Turkish Quarter is also being redeveloped with newly cobbled streets, widened sidewalks, and the restoration of Turkish homes into areas for dining and shopping. In 2011, city hall announced plans to turn Beersheba into the "water city" of Israel. One of the projects, "Beersheva beach," envisions a 7-dunam facility opposite city hall. Other projects include new fountains near the Soroka Medical Center and in front of the Shamoon College of Engineering. In the 1990s, as skyscrapers began to appear in Israel, the construction of high-rise buildings began in Beersheba. Today, downtown Beersheba has been described as a "clean, compact, and somewhat sterile-looking collection of high-rise office and residential towers." The city's tallest building is Rambam Square 2, a 32-story apartment building. Many additional high-rise buildings are planned or are under construction, including skyscrapers. There are further plans to build luxury residential towers in the city. The city is undergoing a major construction boom, which includes both development of urban design elements, such as water fountains and bridges, and environmental development such as playgrounds and parks. In December 2012, a plan to build 16,000 new housing units in the Ramot Gimel neighborhood was scrapped in favor of creating a new urban forest, which will span 1,360 acres (550 ha) and serve as the area's "green lung", as part of the plans to develop a "green band" around the city. The forest will include designated picnic areas, biking trails, and walking trails. According to Mayor Ruvik Danilovich, Beersheba still has an abundance of open, underdeveloped spaces that can be used for urban development. In 2017, a new urban building plan was approved for the city, designed to raise the city's population to 340,000 by 2030. Under the plan, 13,000 more housing units will be built, along with industrial and business developments occupying a total of four million square meters. A second public hospital is also planned. On October 19, 1998, sixty four people were wounded in a grenade attack. On August 31, 2004, sixteen people were killed in two suicide bombings on commuter buses in Beersheba for which Hamas claimed responsibility. On August 28, 2005, another suicide bomber attacked the central bus station, seriously injuring two security guards and 45 bystanders. During Operation Cast Lead, which began on December 27, 2008 and lasted until the ceasefire on January 18, 2009, Hamas fired 2,378 rockets (such as Grad rockets) and mortars, from Gaza into southern Israel, including Beersheba. The rocket attacks have continued, but have been only partially effective since the introduction of the Iron Dome rocket defense system. In 2010 an Arab attacked and injured two people with an axe. In 2012, a Palestinian from Jenin was stopped before a stabbing attack in a "safe house." On October 18, 2015, a lone gunman shot and killed a soldier guarding the Beersheva bus station before being gunned down by police. In September 2016, the Shin Bet thwarted a Palestinian Islamic Jihad terror attack at a wedding hall in Beersheba. Since 1950, Beersheba has changed its municipal emblem several times. The 1950 emblem, designed by Abraham Khalili, featured a tamarix tree, a factory and water flowing from a pipeline. In 1972 the emblem was modernized with the symbolic representation of the Twelve Tribes and a tower. Words from the Bible are insrcibed: Abraham "planted a tamarix tree in Beersheba." (Genesis 21:33) Since 2012, it has incorporated the number seven as part of the city rebranding. Beersheba is located on the northern edge of the Negev desert 115 kilometres (71 mi) south-east of Tel Aviv and 120 kilometres (75 mi) south-west of Jerusalem. The city is located on the main route from the center and north of the country to Eilat in the far south. The Beersheba Valley has been populated for thousands of years, as it has available water, which flows from the Hebron hills in the winter and is stored underground in vast quantities. The main river in Beersheba is Nahal Beersheva, a wadi that floods in the winter. The Kovshim and Katef streams are other important wadis that pass through the city. Beersheba is surrounded by a number of satellite towns, including Omer, Lehavim, and Meitar, and the Bedouin localities of Rahat, Tel as-Sabi, and Lakiya. Just north west of the city (near Ramot neighborhood ) is a region called Goral hills (heb:גבעות גורל lit: hills of fate), the area has hills with up to 500 metres (1,600 feet) above sea level and low as 300 metres (980 feet) above sea level. Due to heavy construction the flora unique to the area is endangered. North east of the city (north to the Neve Menahem neighborhood) there are Loess plains and dry river bands. Beersheba has a hot desert climate (Köppen climate classification BWh) with Mediterranean influences. The city has both characteristics of Mediterranean and desert climates. Summers are hot and dry, and winters are mild. Rainfall is highly concentrated in the winter season, even more so than other cities with a similar climate such as Almería in southern Spain. In summer, the temperatures are high in daytime and nighttime with an average high of 34.7 °C (94 °F) and an average low of 21.4 °C (71 °F). Winters have an average high of 17.7 °C (64 °F) and average low of 7.1 °C (45 °F). Snow is very rare; a snowfall on February 20, 2015 was the first such occurrence in the city since 1992. The largest employers in Beersheba are Soroka Medical Center, the municipality, Israel Defense Forces and Ben-Gurion University. A major Israel Aerospace Industries complex is located in the main industrial zone, north of Highway 60. Numerous electronics and chemical plants, including Teva Pharmaceutical Industries, are located in and around the city. Beersheba is emerging as a high-tech center, with an emphasis on cyber security. A large high-tech park is being built near the Be'er Sheva North Railway Station. Deutsche Telekom, Elbit Systems, EMC, Lockheed Martin, Ness Technologies, WeWork and RAD Data Communications have already opened facilities there, as has a cyberincubator run by Jerusalem Venture Partners. A Science park funded by the RASHI-SACTA Foundation, Beersheba Municipality and private donors was completed in 2008. Another high-tech park is located north of the city near Omer. The Beersheba municipality was plagued for many years by an ineffectual leadership, political problems and poor financial planning. Since 2005, attention has been focused on developing parks and infrastructure. A new youth center opened in 2005, and a new cultural centre opened in 2008. In 2006, after many years of financial struggle, the municipality has achieved a balanced budget. The official emblem of the municipality of Beersheba depicts an eshel (tamarisk tree), the tree planted by Abraham according to Genesis, and the observation tower connected to the municipality building. The mayor of Beersheba is Ruvik Danilovich, who was deputy mayor under Yaakov Turner. After Israeli independence, Beersheba became a "laboratory" for Israeli architecture. Mishol Girit, a neighborhood built in the late 1950s, was the first attempt to create an alternative to the standard public housing projects in Israel. Hashatiah (literally, "the carpet"), also known as Hashekhuna ledugma (the model neighborhood), was hailed by architects around the world. Today, Beersheba is divided into seventeen residential neighborhoods in addition to the Old City and Ramot, an umbrella neighborhood of four sub-districts. Many of the neighbourhoods are named after letters of the Hebrew alphabet, which also have numerical value, but descriptive place names have been given to some of the newer neighborhoods. In 1953, Cinema Keren, the Negev's first movie theater, opened in Beersheba. It was built by the Histadrut and had seating for 1,200 people. Beersheba is the home base of the Israel Sinfonietta, founded in 1973. Over the years, the Sinfonietta has developed a broad repertoire of symphonic works, concerti for solo instruments and large choral productions, among them Handel's Israel in Egypt, masses by Schubert and Mozart, Rossini's "Stabat Mater" and Vivaldi's "Gloria." World-famous artists have appeared as soloists with the Sinfonietta, including Pinchas Zukerman, Jean-Pierre Rampal, Shlomo Mintz, Gary Karr, and Paul Tortelier. In the 1970s, a memorial commemorating fallen Israeli soldiers designed by the sculptor Danny Karavan was erected on a hill north-east of the city. The Beersheba Theater opened in 1973. The Light Opera Group of the Negev, established in 1980, performs musicals in English every year. Landmarks in the city include Abraham's Well and the old Turkish train station, now the focus of development plans. The Artists House of the Negev, in a Mandate-era building, showcases artwork connected in some way to the Negev. In 2009, a new tourist and information center, Gateway to the Negev, was built. In 1906, during the Ottoman era, the Great Mosque of Beersheba was built with donations collected from the Bedouin residents in the Negev. It was used actively as a mosque until the city fell to Israeli forces in 1948. The mosque was used until 1953 as the city's courthouse. From then until the 1990s, when it was closed for renovations, the building housed an archeological museum, which the city intended to turn into the archeological branch of the Negev Museum. In 2011, however, the Supreme Court of Israel, sitting as the High Court of Justice, ordered the property to be turned into a museum of Islam without reverting to a place of worship. Metrodan Beersheba, established in 2003, had a fleet of 90 buses and operates 19 lines in the city between 2003 and 2016, most of which depart from the Beersheba Central Bus Station. These lines were formerly operated by the municipality as the 'Be'er Sheva Urban Bus Services'. Inter-city buses to and from Beersheba are operated by Egged, Dan BaDarom and Metropoline. The intercity bus service was transferred to Dan Be'er Sheva in 25'th of November 2016 and Metrodan Beersheva had been shut down.With the change to Dan Be'er Sheva the company introduced electronic payment stopping pay at the driver which was common in Beersheba. Israel Railways operates two stations in the city that form part of the railway to Beersheba: the old Be'er Sheva North University station, adjacent to Ben Gurion University and Soroka Medical Center, and the new Be'er Sheva Central station, adjacent to the central bus station. Between the two stations, the railway splits into two, and also continues to Dimona and the Dead Sea factories. An extension is planned to Eilat and Arad. The Be'er Sheva North University station is the terminus of the line to Dimona. All stations of Israel Railways can be accessed from Beersheba using transfer stations in Tel Aviv and Lod. Until 2012, the railway line to Beersheba used a slow single-track configuration with sharp curves and many level crossings which limited train speed. Between 2004 and 2012 the line was double tracked and rebuilt using an improved alignment and all its level crossings were grade separated. The rebuilding effort cost NIS 2.8 billion and significantly reduced the travel time and greatly increased the train frequency to and from Tel Aviv and Kiryat Motzkin to Beersheba. In addition, Beersheba will be linked to Tel Aviv and Eilat by a new passenger and freight high-speed railway system. There have been plans for a light rail system in Beersheba for many years, and a light rail system appears in the master plan for the city. An agreement was signed for the construction of a light rail system in 1998, but was not implemented. In 2008, the Israeli Finance Ministry contemplated freezing the Tel Aviv Light Rail project and building a light rail system in Beersheba instead, but that did not happen. In 2014, mayor Ruvik Danilovich announced that the light rail system will be built in the city. In 2017, the Ministry of Transport gave the Beersheba municipality approval to proceed with preliminary planning on a light rail system. Beersheba is linked to Hilvan by the Abraham Path. Beersheba has become Israel's national chess center; thanks to Soviet immigration, it is home to the largest number of chess grandmasters of any city in the world. The city hosted the World Team Chess Championship in 2005, and chess is taught in the city's kindergartens. The Israeli chess team won the silver medal at the 2008 Chess Olympiad and the bronze at the 2010 Olympiad. The chess club was founded in 1973 by Eliyahu Levant, who is still the driving spirit behind it. The city has the second largest wrestling center (AMI wrestling school) in Israel. The center is run by Leonid Shulman and has approximately 2,000 students, most of whom are from Russian immigrant families since the origins of the club are in the Nahal Beka immigrant absorption center. Maccabi Be'er Sheva has a freestyle wrestling team, whilst Hapoel Be'er Sheva has a Greco-Roman wrestling team. In the 2010 World Wrestling Championships, AMI students won five medals. Cricket is played under the auspices of Israel Cricket Association. Beersheba is also home to a rugby team, whose senior and youth squads have won several national titles (including the recent Senior National League 2004–2005 championship). Beersheba's tennis center, which opened in 1991, features eight lighted courts, and the Beersheba (Teyman) airfield is used for gliding. In 2012, the Beersheba "ring trail", a 42-kilometer hiking trail around the city, won third place in the annual environmental competition of the European Travelers Association. ^ Mildred Berman (1965). "The Evolution of Beersheba as an Urban Center". Annals of the Association of American Geographers. 55 (2): 308–326. doi:10.1111/j.1467-8306.1965.tb00520.x. ^ a b "Beer Sheva". Jewishmag.com. Archived from the original on April 30, 2009. Retrieved May 5, 2009. ^ "Beersheba". Jewishvirtuallibrary.org. October 21, 1948. Retrieved August 8, 2013. ^ Abu-Rabia, Aref. A Bedouin Century: Education and Development among the Negev Tribes in the 20th century. Berghahn Books. Retrieved August 8, 2013. ^ a b c d e f g Yasemin Avcı. "The application of Tanzimat in the desert: The Bedouins and the creation of a new town in Southern Palestine (1860–1914)". Middle Eastern Studies. 45 (6): 969–983. doi:10.1080/00263200903268728. ^ George L. Robinson (1901). "The Wells of Beersheba". The Biblical World. 17 (4): 247–255. doi:10.1086/472788. ^ George L. Robinson (1908). "Beersheba Revisited". The Biblical World. 31 (5): 322+327–335. doi:10.1086/474045. ^ Gerdos, Yehuda (1985). "Basis of Beersheba City Planning". In Mordechai Na'or (ed.). Settlement of the Negev, 1900–1960 (in Hebrew). Jerusalem, Israel: Yad Yitzhak Ben-Zvi. pp. 167–177. ^ a b United Nations Special Committee on Palestine, Report to the General Assembly, September 3, 1947, Volume II, A/364, Add. 1 Archived September 10, 2015, at the Wayback Machine. UNGA Resolution 181 (Nov 27, 1947).. See boundaries here. ^ a b Shapira, Anita (2007). Yigal Allon: Native Son. University of Pennsylvania Press. p. 245. Retrieved August 8, 2013. ^ a b "Jewish National Fund: Be'er Sheva River Park". Jnf.org. Retrieved March 12, 2013. ^ רועי צ'יקי ארד 8 July 2011 00:54 עודכן ב: 23:15. "שיגעון המים של בירת הנגב – חינוך וחברה – הארץ". Haaretz.co.il. Retrieved March 12, 2013. ^ "mynet באר שבע – תגידו, צריך חוף ים בבאר שבע?". Mynet.co.il. June 20, 1995. Retrieved March 12, 2013. ^ "מקומי – באר שבע nrg – ...דרעי עצבני: רב העיר ב"ש יוצא לקרב". Nrg.co.il. Retrieved March 12, 2013. ^ "Skyscrapers dotting Tel Aviv landscape | j. the Jewish news weekly of Northern California". Jweekly.com. March 29, 1996. Retrieved March 12, 2013. ^ "Rambam Square 2, Beer Sheva". IL /: Emporis.com. July 21, 2003. Retrieved August 8, 2013. ^ "All buildings | Buildings". Emporis. July 21, 2003. Retrieved March 12, 2013. ^ "Rambam Square 2 | Buildings". IL /: Emporis. July 21, 2003. Retrieved March 12, 2013. ^ "skyscrapers | Buildings". Emporis. Retrieved March 12, 2013. ^ "ynet מגדלים בלב המדבר: תנופת הבנייה מגיעה לב"ש – כלכלה". Ynet.co.il. Retrieved March 12, 2013. ^ "Beersheba opts for trees over urban sprawl – Israel Environment, Ynetnews". Ynetnews.com. June 20, 1995. Retrieved March 12, 2013. ^ "חדשות – צבא וביטחון nrg – ...כיפת ברזל יירטה שתי רקטות". Nrg.co.il. October 31, 2011. Retrieved March 12, 2013. ^ "ynet גראד דוחה מחאה? "גם ספטמבר לא יזיז אותנו" – חדשות". Ynet.co.il. Retrieved March 12, 2013. ^ "חדשות – צבא וביטחון nrg – ...רקטה התפוצצה בבאר שבע; חיל". Nrg.co.il. Retrieved March 12, 2013. ^ "חדשות – צבא וביטחון nrg – ...הרוג ושישה פצועים בפגיעות". Nrg.co.il. Retrieved March 12, 2013. ^ "באר שבע: כוחות גדולים במצוד אחר "התוקף בפטיש" – וואלה! חדשות". News.walla.co.il. Retrieved March 12, 2013. ^ "אלמוני תקף שני גברים בפטיש ליד עיריית באר שבע – וואלה! חדשות". News.walla.co.il. Retrieved March 12, 2013. ^ "נענע10 – סוכל ניסיון פיגוע בבאר שבע: פלסטיני שתכנן לבצע פיגוע דקירה נעצר בדירת מסתור בעיר – חדשות". News.nana10.co.il. June 17, 2009. Retrieved March 12, 2013. ^ "חדשות 2 – סוכל פיגוע דקירה בבאר שבע: מחבל נעצר בדירת מסתור". Mako.co.il. Retrieved March 12, 2013. ^ The Blueprint Negev and the Future of Israel (October 18, 2012). "The Blueprint Negev and the Future of Israel | Jerusalem Post – Blogs". Blogs.jpost.com. Retrieved March 12, 2013. ^ "תוכנית באר שבע אושרה; המטרה – מיליון תושבים עד שנת 2020". Calcalist.co.il. June 20, 1995. Retrieved March 26, 2013. ^ "LOCALITIES, POPULATION AND DENSITY PER SQ. KM. BY METROPOLITAN AREA" (PDF). Retrieved July 3, 2016. ^ "technical college website". Tcb.ac.il. Retrieved August 8, 2013. ^ "school website". Techni-bs.iscool.co.il. Retrieved August 8, 2013. ^ "h2g2 – Be'er Sheva, Israel – A4499625". BBC. Archived from the original on May 31, 2009. Retrieved May 5, 2009. ^ Lubliner, Elan (February 21, 2009). "'Gateway' center aims to help the Negev bloom again". Jerusalem Post. Around Israel. Archived from the original on August 13, 2011. Retrieved May 5, 2009. ^ "Will Be'er Sheva allow Muslims to use city's only mosque? – Haaretz – Israel News". Haaretz. Archived from the original on June 6, 2009. Retrieved July 7, 2009. ^ "Map of lines of the Metropoline company" (in Hebrew). Metropoline. Archived from the original on December 17, 2008. Retrieved November 24, 2008. ^ Hazelkorn, Shahar (March 17, 2008). "Mofaz Decided: A Railway to Eilat Will Be Built" (in Hebrew). Ynet. Archived from the original on March 21, 2008. Retrieved March 25, 2008. ^ "Eilat high speed rail line gets green line". Airrailnews.com. February 14, 2013. Archived from the original on April 10, 2013. Retrieved March 26, 2013. ^ "mynet באר שבע – רכבת קלה? הצחקתם את הבאר שבעיים". Mynet.co.il. June 20, 1995. Retrieved March 26, 2013. ^ "mynet באר שבע – באר שבע מובילה במאבק על ספורט ההאבקות". Mynet.co.il. Retrieved March 26, 2013. ^ "Beersheba wins EU's green travel award". Ynetnews.com. June 20, 1995. Retrieved August 8, 2013. ^ "International Relations of the City of Beersheba" (in Hebrew). Beersheba Municipality. Archived from the original on February 13, 2012. Retrieved February 8, 2012. ^ "Villes amies de Bouaké" [Twin towns with Bouaké] (in French). mairiebke.e-monsite.com. Retrieved August 20, 2014. ^ "Partner Cities of Lyon and Greater Lyon". copyright 2008 Mairie de Lyon. Archived from the original on July 19, 2009. Retrieved October 21, 2008. Thareani-Sussely, Yifat (2007). "The 'Archaeology of the Days of Manasseh' Reconsidered in the Light of Evidence From The Beersheba Valley". Palestine Exploration Quarterly. 139 (2): 69–77. doi:10.1179/003103207x194091.